24 posts categorized "Chapter 13"
I have just finished reading Lois Lupica’s paper on her impressive consumer bankruptcy fee study. This is a model of what empirical, law-and-society research should be – it combines data from electronic court records with focus groups and key player interviews to give a textured understanding of the role lawyer’s fees play in this particular legal system. The finding that jumped out for me was a little-discussed but critical aspect of local bankruptcy culture: not how much, but when the trustee pays Chapter 13 lawyers’ fees (pp. 105-106). I practiced in a district where (before BAPCPA) the trustee paid out the fees as the first priority claim i.e. ahead of even secured creditors, but adequate protection payments (current mortgage and auto loan payments, e.g.) were paid directly to the creditors. There are apparently districts where every plan must include a $200 monthly payment for the first 15 months to pay the attorney, others where the pre-confirmation adequate protection payments are diverted to the attorney’s fees and added to the arrears paid over the remaining plan life (i.e. borrowed from secured creditors), and many other fascinating variations. Considering the practical consequences of these disparate rules for attorneys as they decide what cases to take, and how to structure plan payments, it is easy to see why Chapter choice, and Chapter 13 success rates, would vary so dramatically from one district to another. For example, the front-loading of payments for the legal fee, followed by a payment step-down, would seem to increase the risk of plan failure. The sooner the lawyer is paid, the less risk she takes in filing the case. That could increase access, but could also encourage filing more risky Chapter 13 plans. If we are concerned about the high failure rate of Chapter 13s on the one hand, and the high costs and difficulty of obtaining counsel on the other, we might do well to study these variations further to see what outcomes they produce for debtors, creditors and lawyers. It also struck me that Professor Lupica's extensive data tables with fees actually paid, by chapter, state, district and case outcome, and no-look fees for Chapter 13, can provide important independent variables for other studies modeling bankruptcy outcomes. Do Your Research, Ezra Klein! The right question on housing, then, is not whether the administration’s policies proved insufficient. They did. It’s what would have been better. And that’s not a question that either Appelbaum or Goldfarb conclusively answer. It’s not even a question that the most credible critics of the Obama administration’s housing policies conclusively answer. The Yale Journal of Law and the Humanities held a symposium on "Courts: Representing and Contesting Ideologies of the Public Sphere" in 2011, and recently published papers from this event. Some of the contributions to this symposium, especially the piece by Judith Resnik and Dennis Curtis, and the commentary by William Simon, emphasize the potential disconnect between representations of law and justice that might adorn courthouses and the nature of the actual work that goes on inside. Although these scholars did not discuss the bankruptcy court in depth (Simon does mention that scholars have long seen bankruptcy as deviating from traditional models of adjudication), each side of the disconnect may be quite interesting for our purposes. For the past couple of years, I've been thinking that cramdown is dead as a policy solution. But I was thinking about cramdown as requiring legislation. It doesn't. We could start doing it tomorrow. Under current bankruptcy law, a Chapter 13 plan may be confirmed only if secured creditors receive their collateral, receive the value of their collateral, or consent to the plan. The legislative proposals for cramdown all sought to enable involuntary modification of mortgages; cramdown was to be the stick that would encourage voluntary modifications. A few weeks ago, I put up a post describing the states with the highest and lowest per capita bankruptcy rates by chapter of the Bankruptcy Code. 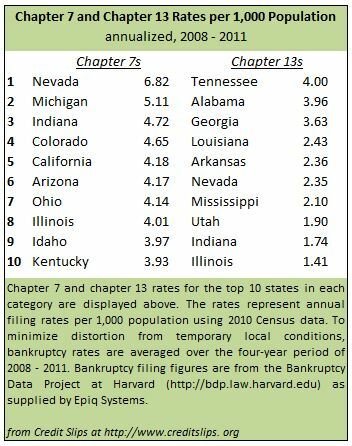 A closely related data point is which states have the highest percentage of bankruptcies that are chapter 13s. States with a high per capita rate of chapter 13s not surprisingly are the same states that tend to have the highest percentage of banrkuptcies that are chapter 13s. Anyway, my point is that I made a map. Actually, I had to make the map of chapter 13 filing percentages for another purpose, and I thought maybe some other persons might have a use for it. So here it is. You are welcome to use it. If you want to download it, be sure to click on it so that a larger version opens up in a pop-up window. If you do use it, all I ask is that you attribute it back to Credit Slips and me. Between states, there is a big disparity in the rate at which people file bankruptcy. Over the past four years, Nevada has had the highest bankruptcy filing with an a yearly average of 9.32 persons per 1,000 population file bankruptcy. At the other extreme has been Alaska with just 1.39 persons per 1,000 filing bankruptcy. As points of comparison, consider that the national filing rate over 2008 - 2011 was 3.54 per 1,000 population and that the national filing rate over the last twelve months has been 4.26 per 1,000 population. I wondered how the filing rates would break down if we looked at just chapter 7 and chapter 13 separately. The result is the chart to the right. As Adam noted in his kind post, the New York Times today featured our study, "Race, Attorney Influence, and Bankruptcy Chapter Choice." My co-authors are Credit Slips blogger Jean Braucher, a law professor at the University of Arizona, and Dov Cohen, a professor at the University of Illinois who holds a cross appointment in psychology and law. And, we all express many thanks to the NYT reporter, Tara Siegel Bernard, who spent a lot of time slogging through the statistics and legal intricacies in our study. In a nutshell, the study reports real-world data from the Consumer Bankruptcy Project showing that, among bankrupcy filers, blacks file chapter 13 at higher rates than all other races. The effect is large -- for example, blacks even had a higher chapter 13 rate (54.6%) than homeowners (47.1%). The second part of the study showed that, in a random sample, bankruptcy attorneys were more likely to recommend chapter 13 for a hypothetical couple named "Reggie & Latisha" who went to the African Methodist Episcopal Church as compared to "Todd & Allison" who went to the United Methodist Church. Also, attorneys were more likely to see "Reggie & Latisha" as having good values and being more competent when they expressed a preference for chapter 13.